I’ll let you in on a secret; our ground floor is made up of only 2 rooms. The first is the living area which is North facing and has space for a sofa and a dining table and chairs at a squish. The second is my small galley kitchen, South facing, which is bathed with light the whole day through. This is the heart of my home and where I spend most of my day. The kids are part of the furniture in the kitchen, standing on chairs to peek at what’s on the hob; they stir, mix, peel and the 5-year-old chops to help me out. We come up with recipes together and eat together. Sometimes (often) the toddler climbs on the table, so at least the kitchen is small enough that I’m only 1 step away from being able to pop him back down to earth when required. Cooking with kids is something that just happens in my home. There is no structured “cooking time” or time set aside to do cooking with them. This is the best way to teach kids how to cook I feel, it’s almost by osmosis as they just pick it up because it’s part of everyday life. It’s also how I learned to cook when I was younger. Now if you have an image in your head of a light filled kitchen with clean children, me in an apron & immaculate countertops, give it a shake right now! There is no shame in hiding vegetables in food to make sure your kids eat a varied diet. It’s not burnt, it’s well cooked. It’s not a smoke alarm, it’s a heat sensor. Cleaning up is part of the learning process. 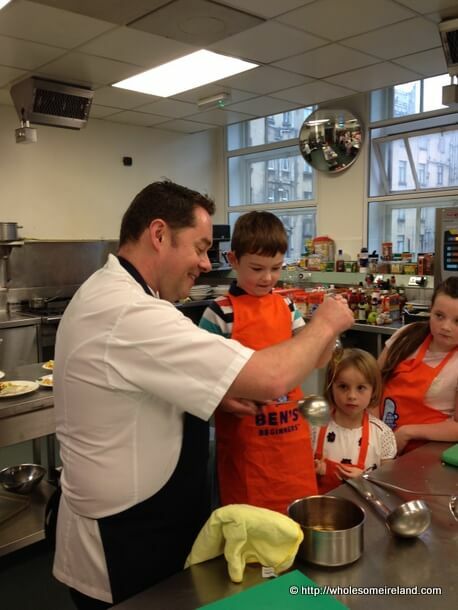 Last weekend I was a guest of Uncle Ben’s Ireland at a cookery class and lunch hosted by Neven Maguire. It was in a semi-professional kitchen in DIT Cathal Brugha Street, somewhere I’ve been to cook before. I don’t often get a chance to do things with the 5-year-old on his own and it was a real treat to take the train and venture into Dublin for the day together. While he had a ball, the necessary restrictions in a professional kitchen were tough to handle, as he’s well used to a kitchen and how to cook. His favourite part of the day? That had to be making a sugar basket under Neven’s supervision, no contest. He was as proud as punch with the resulting basket. It lasted about 20 seconds after I took this picture. At which point he ate it! Uncle Ben’s Ireland have a competition at the moment on their Facebook page with a top prize of €5,000 for a family and a further €10,000 to be won for a school of their choice. If you’re interested in entering, all you need to do is to like their page, then post a picture or video of you cooking something healthy with your kids. It is I’m afraid, something of a popularity contest as voting commences on 4th November. That does leave you just over a week to get your entry together, bearing in mind the kids are on midterm break next week. Disclosure: Uncle Ben’s Ireland invited me to a cookery class and lunch with Neven Maguire to introduce me to their Ben’s Beginners campaign. No blogpost was required or requested of me. My opinions are my own and I am not paid to give them. Lovely pics!Looking forward to the day Mini joins us in the kitchen. I’m sure it will happen!! Thank you for sharing your kitchen with us, I could picture the loving and fun (albeit messy!) atmosphere there must be in there most of the time. I do believe that this is the best way to teach children how to eat healthy and have good food habits that will last them a lifetime. 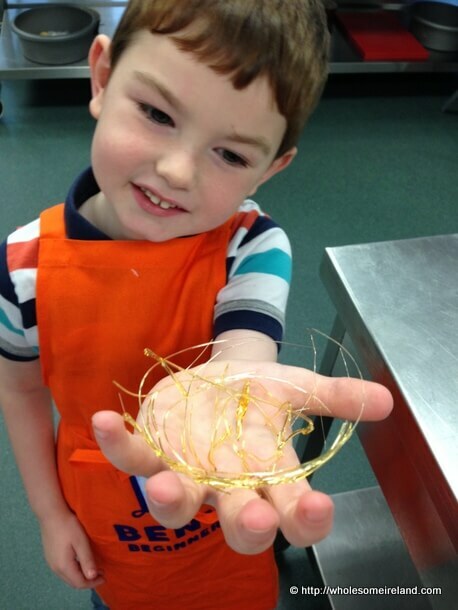 Well done on your little chap for his lovely caramel basket, here’s a little chef in the making no doubt! Thanks Nono.The love of cooking good food is so important to nurture I feel. “Real families make messes”. That should be on a plaque in every household! It’s the truth April, we know it! great post, thanks for sharing, my kids also love to help me out in kitchen, specially my little daughter loves cooking, she say one day i will become great chef, will be back for more keep posting. Thank you for dropping by. Lovely comment, much appreciated! Thanks for this lovely blog. We love to cook in my house but absolutely it gets very messy and chaotic at times but worth the effort. I hope my little ones are learning by osmosis!! It really is. She is a credit to you! Ah thank you Regina. Mess is a sign of happy kids I always feel. My children are grown now, but they always helped me in the kitchen. Sometimes it was frustrating for me, as having them help took at least twice as long and made a huge mess that I would have to clean later, but somehow I knew that these were memories we were making. Today, my oldest son does all of the cooking for his own family and has worked in restaurants for most of his adult life, and my youngest child is in culinary school right now studying to become a pastry chef. (She just completed an internship at Walt Disney World! She said it was every bit as much fun as you would think it would be!) Both of my children say it was because of the fun they had helping me in the kitchen that helped them make these career choices. Keep it up! You never know where it will lead! That is just fantastic Kat89. Thank you for sharing & best wishes to your children in their careers!